Now that I have 5GB worth of SD cards to play around with there is obviously one activity that I find myself repeating at least once a day. Namely, adding and removing files from each of these cards. Although a software solution such as Card Export II will allow you to read and write to an SD card inserted in your Treo via the sync cable, I have a preference for simple and fast solutions and so like most I use an SD card reader to quickly transfer files to my Treo. I've had a few of these over the last year (picture below) as I searched for the ideal solution and moved from a PQI USB 1.0 to a PNY USB 2.0 to a SanDisk PCMCIA 6-in-1 (which proved much slower than USB 2.0 versions) and finally settled on the new SanDisk MobileMate USB 2.0 card reader because it was the smallest that I could find. The SanDisk MobileMate is an SD, mSD, MMC, RS-MMC and TF card reader. The card is side loaded with a rubber strip covering the slot when empty and a bottom green flashing light when in use. Also, if your USB slots happen to be at the back of your PC there is a 6" extension cord. There are a couple of things that a future version of this card reader could improve upon. The blinking 'active' light is barely visible in daylight while the rubber cover just seems to stand in the way (I actually cut it off after taking these pictures) and the plastic cover for the USB pin is so small that it's just bound to get lost. 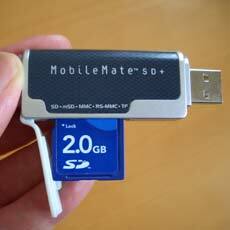 At present however, the MobileMate is my preferred Treo SD card reader principally because of its small size. Interesting that USB 2.0 is quicker than the PC Card solution... I've been quite pleased with my Sandisk PC Card which I use almost daily. Same here Jonathan - I had always thought that the PCMCIA card would be faster. However, the difference with USB 2.0 was quite staggering - about twice as fast. I too purchased the mobilemate some time ago at a best buy for $20. it's been well worth it. If you're like me, you have multiple devices with different media (digital camera with CF, PSP with Memory Stick Pro, etc.) You also probably have friends/family that have other formats as well, and you'd sometimes like to grab stuff off their cards. So, a good all-in-one reader is needed. While my favorite all-in-one won't replace a good mobile reader (like the MobileMate), they make a great compliment. For $30, you get an all-in-one reader that can transfer files directly between different cards, a convenient port passthrough for your USB, FireWire, and even sound ports, and a handy fan controller. If I have Card Export II why do I need on of these card readers?? Is the benefit Speed?? Sorry if this is a stupid question, but if there is a definate benefit I surely go get one. I recently got a 2gig Card as well which gives me @ 3gigs to play w/. So I too need the "Best" way to read, write, & transfer files. Speed is the benefit of external card readers. When I first started, I used to use an card reader, but every once in a while the card would corrupt. either the card reader wouldnt read it or the treo wouldnt. I got Card Export ii, and havent looked back. I just got a couple of the PQI readers. Their design is pretty good, sort of a Y shape and card goes in the back. $15-18 depending on where you go. I'm developing best practices for my colleagues at work, and I've got two ways of turning the Treo into a flash drive. One is to use a SD to USB device like the one Andrew mentioned above, or the Bonzai Upgradeable Flash Drive (what I'm using, http://www.simpletech.com/estore/index.php?partNumber=STI-USB2BONZAI), or the Dazzle ZiO drive (http://www.onecall.com/PID_21563.htm). The other is to use CardExportII and a retractable synch&charge cable, which isn't much bigger than the SD-to-USB converter. I prefer the second method, because it also gives one the option of grabbing some power from the nearest USB port when one's in a pinch. If one didn't want to use a card reader, and only use Card Export II, would it be wise to get one of the touted fast speed type cards? Is there an advantage in speed if you are running apps off of your card on your Treo for instance? Or is most of the speed all about the transfer from your computer to your disk? Having multiple 1GB cards is an option depending on your preferences. There is no word on if and when we will have a 5GB SD card. The next capacity is most likely a 4GB. Several Treo applications can be configured to use the SD card for cache storage (QuickNews is one I use frequently), or document storage (Acrobat Reader, Documents To Go, eBook readers, music/video players). You can even store the applications themselves on the SD card. In cases like these, having a fast card makes a big difference in day-to-day usage, not just accessing the card from a computer. It's a user-submitted read/write performance database of a wide variety of cards and palm devices based on on-device speed tests. There's a huge difference in performance between the slowest and the fastest cards. i have a phone. i put in a micro sd and it didnt read it, the store i bought it from said it cant read sd only TF cards.. whats the difference between them and where can i get one? thanks in advance!